I have always loved my name. In fact I never met another Hayden until I emigrated to Australia from the UK when I was thirty eight years old. Strangely enough, there are heaps of them here. We were all gifted with a name when we came into the world. But have you ever wondered what is actually in a name? 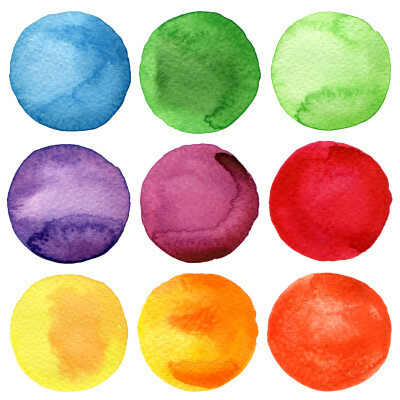 Our name encapsulates a colour vibration that delivers the key to our personality archetype. Pythagorus believed that there was a relationship between colours, numbers and the alphabet. Coincidentally, the calculation for your name’s colour is also the same calculation for your Expression Number. 1. Take each letter in your ‘living’ name and locate its corresponding number in the right hand column on the chart to the right. This is the name you currently like to use not necessarily the one you were born with. You can also calculate just your first name as you will notice the influence is relevant for both. 2. Add up all of the numbers and next reduce it to a single digit. An interesting experiment to do before you calculate this is to examine the colour or colours that you naturally gravitate towards and see if there is any synchronicity. Understanding your unique colour frequencies is an important leg of the journey to rediscover your soul truth which enables you to rebalance, release self doubt, restlessness and discontentment. 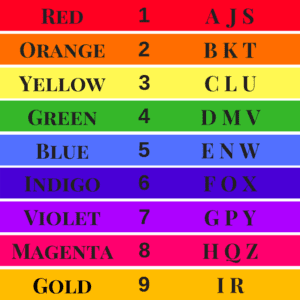 Now calculate your own Colour Character Number and read the corresponding colour in the guide below. The red character is a passionate, courageous risk taker with a dominant character. A flamboyant soul full of vitality and tenacity. They should embrace patience with those who go through life at a slower pace. This personality colour is often aligned with learning, education and the teaching or training of people. The orange character is playful, exciting and friendly with an incredible sense of humour. They are quietly confident and possess determination to defeat life’s challenges. They are creative, adore being sociable and generally having a laugh. This personality colour is beneficial within an alternative wellness business. The yellow character is joyous, alluring, bold, hypnotic, clever and creative. They can be also be psychic and love to be appreciated by their community. This personality colour offers frivolity, happiness and an eagerness to assist. They also have craving for serenity and sensitivity. The green character is balanced, harmonious and forgiving. They are the perfect balance between the physical and mental planes. This personality colour is grounded, logical and rarely swayed to do anything not in line with their ethics. They are a loyal friend but can become cautious, suspicious and can be manipulated by other people. The blue character is empathetic, adaptable, idealist, placid, patient and devoted. They adjust to motherhood extremely well. This colour personality is modern, tolerant, fun-loving and have an appetite for travelling and communications. The indigo character is a brilliant old soul who is intuitive, sensitive, impulsive and ambitious with a great zest for life. They transmit a approachable quality and give off a friendly aura. This colour personality is cooperative, kind, sociable but can behave a bit erratically occasionally. Beneficial for artists, musicians and for those interested in the occult. The violet character is an alert and wise spirit. Loving, charitable, nostalgic and creative. Direct and outspoken with a strong desire for enlightenment as well as for cultivating personal independence. This colour personality is honest, analytical and a true leader in there own genius. The magenta character is the classic utopian, empathic and merciful. They honour the highest aspects of people so can make superior teachers. The magenta personality is sensitive, generous, and intuitive. As free-thinkers they seldom judge people and are known for their tolerance. It is suggested that they use their creativity or they could become despondent. The gold character is frank, expressive, creative and autonomous. Their endurance to overcome adversity or resistance in life is admirable. The gold personality also offers a venturous and amorous nature. They should develop some sacred techniques to enhance their wellbeing especially as this influence can manifest as issues in close relationships. During this process I was delighted to discover that the colours that naturally attract me are encapsulated in the vibration of my name. Yellow for Hayden and red for Hayden Crawford.